In aviation, a tailstrike or tail strike occurs when the tail or empennage of an aircraft strikes the ground or other stationary object. This can happen with a fixed-wing aircraft with tricycle undercarriage, in both takeoff where the pilot rotates the nose up too rapidly, or in landing where the pilot raises the nose too sharply during final approach, often in attempting to land too near the runway threshold. It can also happen during helicopter operations close to the ground, when the tail inadvertently strikes an obstacle. A minor tailstrike incident may not be dangerous in itself, but the aircraft may still be weakened and must be thoroughly inspected and repaired if a more disastrous accident is to be avoided later in its operating life. 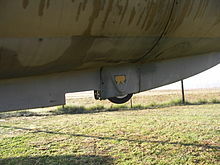 Fixed-wing aircraft with a conventional tail and tricycle undercarriage are vulnerable to tailstrike. Those which require a high angle of attack on takeoff or landing are especially so. They may be fitted with a protection device such as a small tailwheel (Concorde and the Saab Draken), tailskid (Diamond DA20), or reinforced tail bumper. The device may be fixed or retractable. Tailstrike incidents are rarely dangerous in themselves, but the aircraft must be thoroughly inspected and repairs may be difficult and expensive if the pressure hull is involved. Inadequate inspections and improper repairs to damaged airframes after a tailstrike have been known to cause catastrophic structural failure long after the tailstrike incident following multiple pressurization cycles. KLM Flight 4805, severe tailstrike while attempting to avoid collision in the Tenerife airport disaster. Japan Airlines Flight 123, improper repairs to an earlier tailstrike on landing, resulting in catastrophic structural failure seven years later. China Airlines Flight 611, improper repairs to a tailstrike on landing, resulting in catastrophic failure twenty-two years later. ^ "Helicopter Safety" Flight, 15 April 1998, p.32.